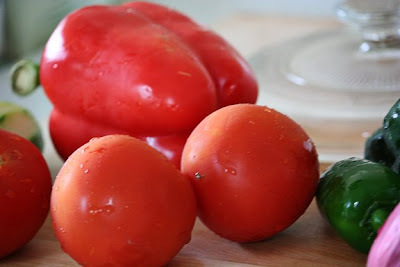 This photo is the makings of salsa. This photo was also taken several weeks ago. With all the summer time activity, I keep finding myself a day behind in posting and lacking in photos. The activity from the previous day keeps me out past midnight and I usually haven't been able to take any photos that day. Some of the activities have left me completely exhausted the next day, like I worked out for 8+ hours exhaustion. It's been very difficult to stay grounded this summer. Not that it hasn't been fun or enjoyable stuff but all very ungrounding. So once again ... Monday rolls around and it's time to get grounded and present. Any tips from anyone on what you do to get and stay grounded? I try daily to light a candle and state my intention ... the way we do at the beginning of yoga. I also get back to center in the morning when I am on the train. It's about an 11 minute ride from Ballston to Dunn Loring and that short ride with my starbucks latte grounds me for some reason, maybe because I am "alone" and am able to let my mind go blank.